Alright, here is a recipe for those nights when you just need something quick, easy and light. With just a few ingredients, no chopping and barely any cooking, this is a no brainer. The flavor of this pasta is light and fresh and can be the jumping off point for any number of variations. The light, creamy ricotta brings together the sweet peas, bright lemon and spicy pepper absolutely perfectly. If you want to take it a little further, add some fresh basil, some grilled chicken or maybe some kalamata olives. …but I liked it just the way it was. Simple, fresh and easy. Oh, also, this recipe is great because you can make just one serving at a time or multiple. It’s very forgiving so you don’t even really need to measure the ingredients. 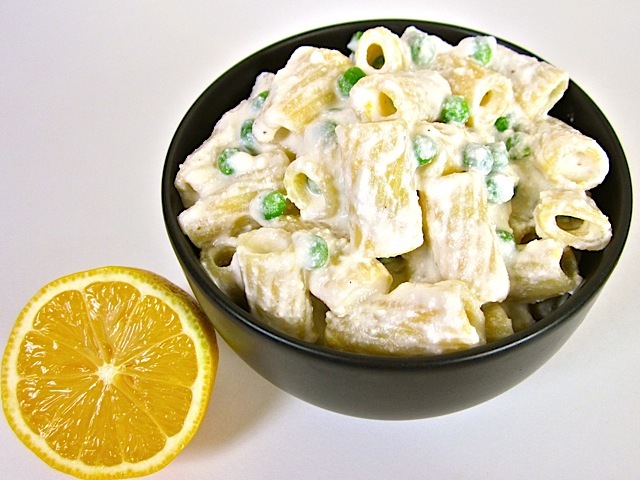 Make a quick, light, and creamy sauce for pasta with ricotta cheese and lemon. Bring a pot of lightly salted water up to a boil. Add the pasta and cook according to the package directions (boil for 7-10 minutes or until al dente). Remove one cup of peas from the freezer so they can begin to thaw. While the pasta is boiling, begin to make the sauce. 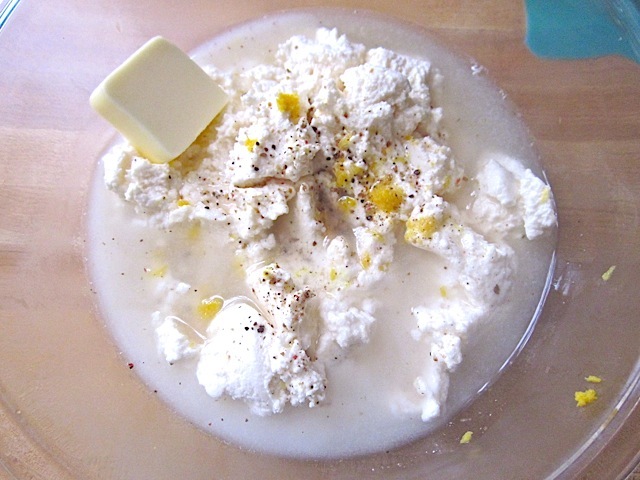 In a large bowl, combine the ricotta, butter, salt (about 1/2 tsp), freshly ground pepper (about 20 cranks of a pepper mill) and the juice and zest of one lemon. When the pasta is almost finished boiling, take 1/3 cup of the hot, starchy pasta water and whisk it into the other ingredients to create a smooth sauce. Adjust the salt and pepper as needed. 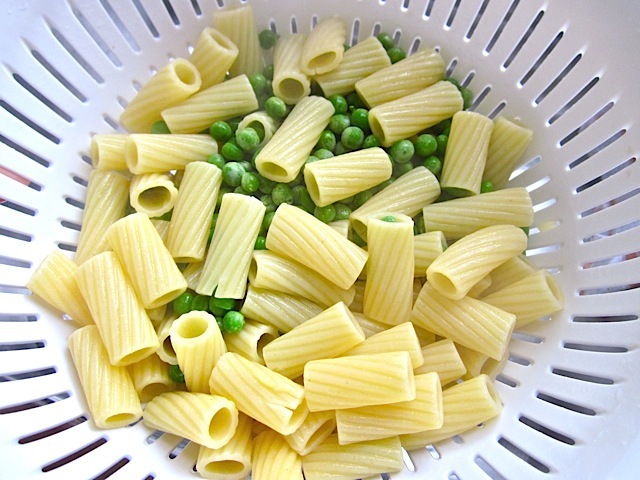 Place the peas in a colander and pour the boiling pasta over them to drain (this speeds up the thawing process). 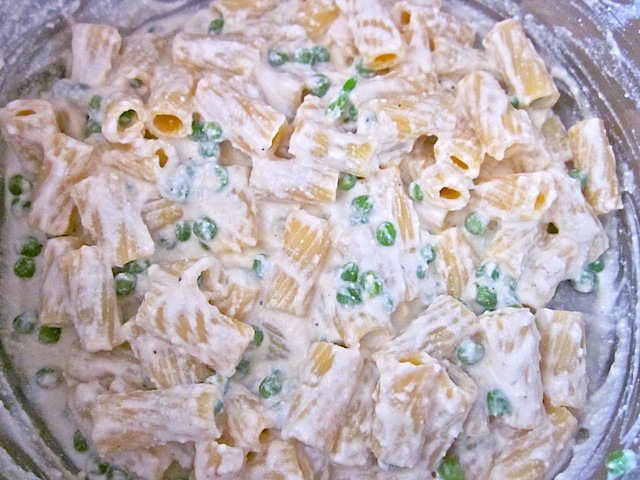 When the pasta has drained and is still hot, stir the pasta and peas into the ricotta cheese sauce. Serve hot or cold. Get your pasta boiling and in the mean time, combine the ingredients for the sauce. 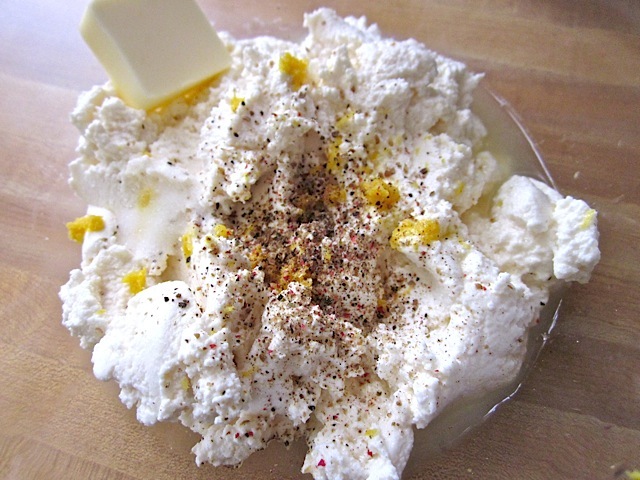 Add the ricotta, butter, lemon juice, lemon zest, salt and pepper to a large bowl. Before you dump the hot pasta water, add 1/3 cup of it to the sauce ingredients. Wait until the pasta is almost done cooking to get the water so it will be very starchy. 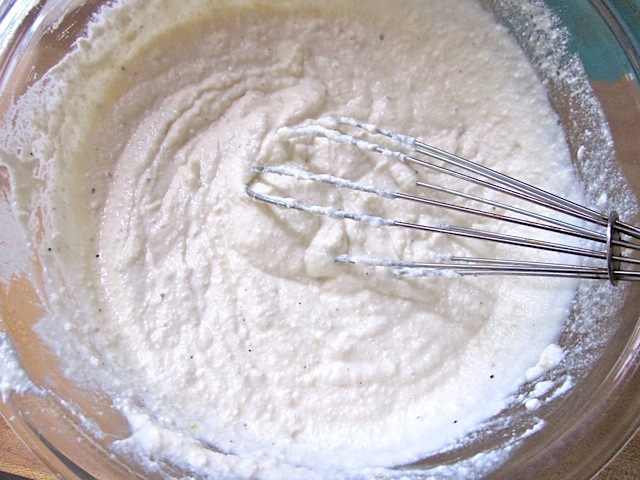 Whisk the ingredients together until smooth. Adjust the salt and pepper as needed. Drain the cooked pasta in a colander. I like to put the frozen peas in the colander before I dump the pasta and water in so that the hot water will thaw the peas. 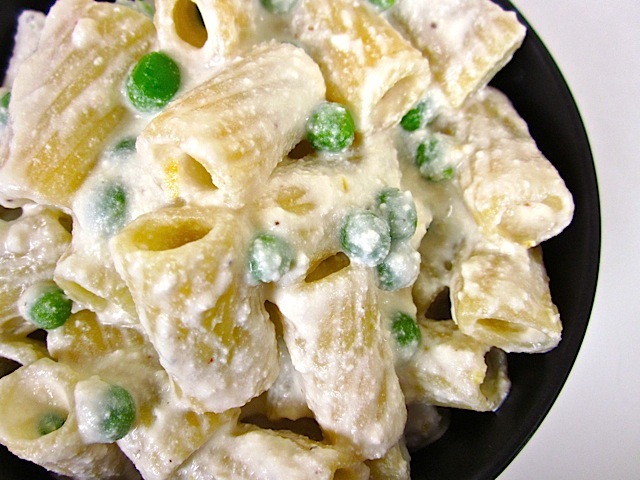 Stir the cooked pasta and peas into the cheese sauce and serve! I ate this pasta both hot and cold and it was fabulous both ways! This was delicious and so easy!! Perfect for a weeknight meal. I used part skim ricotta and .5 T of butter to cut down on the calories a bit and it was a winner. I’m not really familiar with American measurements. Do you know a good place to look that up? I tried some, but they all told me to multiply oz with 28 to get to grams and I think that doesn’t add up for this recipe. 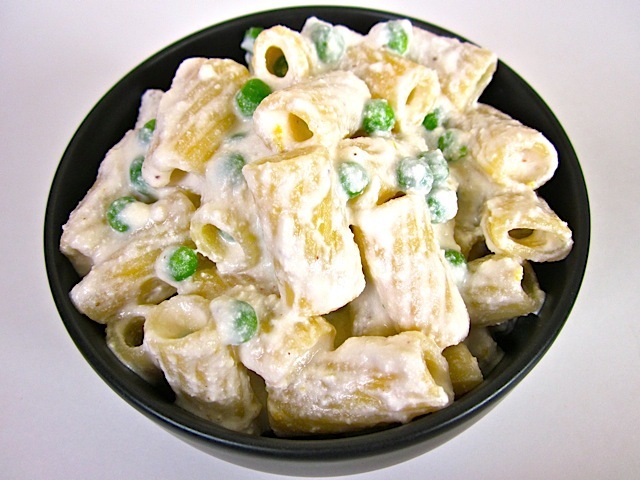 Normally I would take 125g pasta per person – according to this method this recipe would only have 224g for 4 people..
Yep, if you Google “weight conversion” Google opens a conversion calculator for you, and there are several others available online, like this one.